Today we are lucky enough to have Rikki with us from Happy Haws Home- she is such an amazing person who is willing to share her story with us. Please take a moment to read this post and feel free to leave comments in response on our Facebook page. When someone says "1 in 5" what do you think? I'll give you a hint, it's a statistic. A statistic I hope you never have to experience. 1 in 5 pregnancies end in a miscarriage. Recurrent miscarriage consists of 3 or more miscarriages in a row and only 1 in 100 women will have a recurrent miscarriage. I'm one. I am 1 in 100. As for the 1 in 5, I am 1 in 5 in a different way. 1 birth and living baby out of 5 pregnancies. In December 2012 I married my handsome husband Alex! In February 2013 we decided it was time for us to start our own little family. In March and then later in November I miscarried. With both those miscarriages I had no clue I was pregnant until after I had miscarried and I only made it about 6 weeks (According to my falling hormone levels). For me, this was the first time I actually got to see the lines and know I was pregnant. I ran downstairs to my husband and I emailed my mom. I was beyond thrilled. I scheduled an appointment with an OB but they wanted me to wait until I would be about 10 weeks. For me, 10 weeks was a LONG time considering I was not very good at making it passed 6 weeks. When it got closer to my appointment, I got more and more excited. The day before my appointment I woke up about 9 o'clock at night in the worst pain imaginable. I'd had kidney stones but they could not even TOUCH the pain I was feeling. I got up and went to the bathroom thinking I was just passing the largest stone ever, but there was blood... LOTS of blood. I was doubled over in pain i could barely talk. Once i finally caught my breath I remember screaming "ALEX!" He jumped straight out of bed from a dead sleep. I couldn't catch my breath again to tell him that something was wrong but he knew. He could tell I was in way too much pain. So, we got up and rushed to the nearest Emergency Room. It was there that I went through full labor and passed my twins. We had no clue we were having twins and I was crushed. This was my first time really experiencing a miscarriage. Feeling the pain. The loss. The broken heart. I spent another few hours in the hospital after I passed the babies to make sure there were no complications. We got home at 1 in the morning on a Sunday. Alex was kind enough to pin up blankets on all the windows in the room so that I could sleep as long as I wanted. Later that day I got up to grab some food and curl back up in bed when the doorbell rang. It was one of my very dear friends and I had to put on a happy face. She noticed I had an ER bracelet and asked. I was not ready for someone to ask. She was one of the only other people I had told that I was pregnant so of course she asked if the baby was ok. I quickly responded it was just another kidney stone and she left. For the next hour I sat in my bed crying. Eventually I cried myself asleep and didn't wake up until the middle of the night and only got up to eat. That routine basically became my life for the next two weeks. I slept. I ate. I cried. My friend ended up coming back bringing up dinner. She and her husband stayed for a little while, so of course, the truth came out. I had only told our mother's what had happened and that was just through an email. It could never have prepared me to say it out loud to someone. One evening when I woke up after sleeping all day, I started going downstairs to get some food. I heard Alex crying and talking to someone so I stopped on the stairs to listen. He was on the phone with his mom. There he was, crying his eyes out, telling his mom how hard it had been on him to go to school while grieving the loss of out babies. That's when it hit me. I was being selfish. I wasn't the only one who had lost the babies, my husband had too. I went back upstairs to bed since I knew Alex was coming up to bed. That night we laid in bed crying together. This was the moment I realized I was not alone, that I would never be alone. Maybe that is what made my next miscarriage much easier to get through. So, 10 1/2 short weeks later I was losing another baby the morning of my first OB appointment for the baby. This may be too much information (You've now been warned) but I was able to catch the baby. So, we took the baby with us so they could test it to see why my body could not hold on to even one baby! A few weeks later we went back in for the news. I was so afraid. Afraid of what my doctor was going to say. Afraid I would never be able to have a child of my own. "All the tests on the fetus came back fine. There was nothing wrong with it. Your hormone levels are great, your uterus looks great, so my conclusion is you are too fertile." There was a small study recently that looked at women who’d suffered recurrent miscarriages. It found that the endometrium of these women might be extremely receptive to embryos, allowing even poor-quality ones to embed and survive for longer. So, the women studied were falling pregnant very easily, but the embryos weren’t necessarily healthy enough to survive – hence the repeated miscarriages. The media went crazy with claims of ‘super’ fertility, which makes it sound like a positive thing. However, these women don’t have lots of babies, they have lots of miscarriages. At this point, my doctor said that I may never have a live birth, but she was determined to try! My pregnancy wasn't easy and we had many scares but it was SO worth it! I hope everyone that is going through or has gone through miscarriages gets their rainbow baby(s). There are many people who have asked me how I got through all my miscarriages. My answer will always be that same. I let myself grieve, I cried, I prayed, I cried some more, and I prayed a little harder! I've gone through miscarriages that I let myself grieve and miscarriages where I tried to hold it all in. The ones where I let myself grieve were a lot easier to get through. You lost a baby. A human being. It's going to hurt physically and emotionally!The grieving process is the same as if you lost a different family member. I never needed counseling, but some people may need it! Do NOT be ashamed if you do! 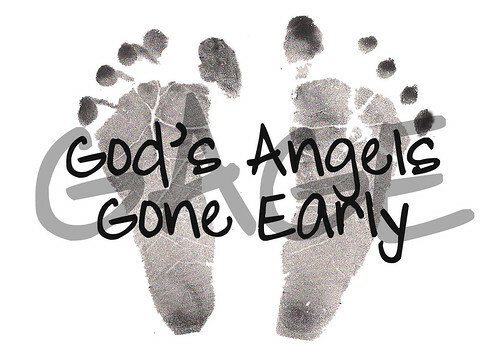 The reason I am sharing my story today is October 15th is National Pregnancy and Infant Loss Awareness day. The entire month of October is to be aware of those mothers who grieve in silence. Today is the day we all come together and remember who we lost. Leave a link in the comments if you end up doing something in memory of your lost ones. I would love to see it! Thanks for reading and sharing with me. f you would like to guest post with us this month it isn't too late, please send us a message via our Contact Us page.